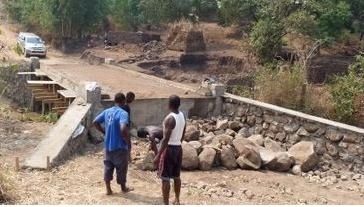 Many congratulations to David Pearson and his colleagues at the Rotary Club of Limbe in Malawi who have, after a lot of hard work, organised the building of a bridge over the Milo River (see report from Joshua Orphan and Community Care (Malawi). My thanks, also, to Russ King for overseeing it from a Club Foundation point of view. A safe crossing. For the first time ever! Thankfully for most of us travelling to work, school or to the shops is an uneventful journey, but children crossing the Milo River in the rainy season to get to school have been risking their lives for years. Last year alone, four children died trying to cross the stream, which becomes a fast flowing river in the rainy season.